This is part two of a three part series on the new NBA TV studio. Part one can be viewed here. Creating a new home for NBA TV was a massive undertaking by Innovative Show Design (ISD), bringing together design, technology and skilled people. Working 100 percent in-house, ISD was able to take the project from studio dimensions to a detailed 3D model. 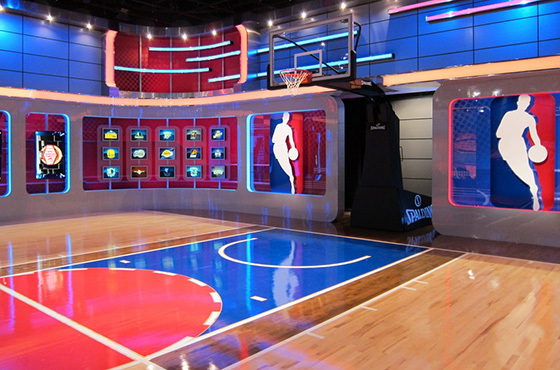 NBA TV provided a detailed list of requirements, which would allow them to use the studio for multiple daily shows with unique settings. “We included as many of these items that we felt worked best not only for the design but also for budget,” said Garrone. Working in Cinema 4D, ISD rendered all aspects of the studio for the proposal. These renders were then turned back into engineering drawings for precious construction. “Upon approval of design the Cinema 4D scene files were re-imported into Vectorworks, where all scenic engineering was formulated and shop drawings were produced,” said Garrone. A unique aspect of Innovative Show Design’s presentation is true to life camera positioning. 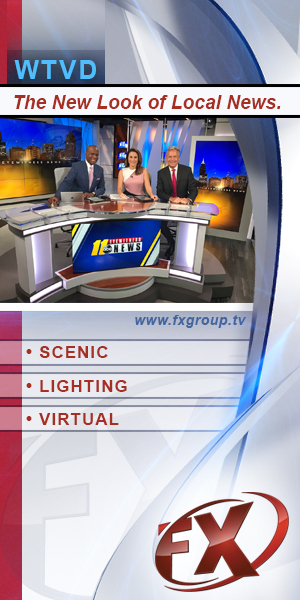 “A part of our presentation consists of us using Cinema 4D to display exact camera angles and composition, utilizing true camera placement as well as depth of field, so that our clients have an accurate visual representation of how our design functions,” said Nate Mitchell, scenic designer and graphic supervisor at ISD. Lighting design was handled the same way, giving the NBA TV a true view of the project. 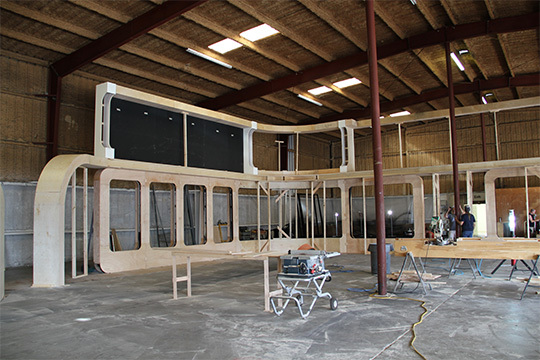 After winning the proposal, ISD had seven weeks to construct, dry fit, laminate and ship all scenic elements from Lakeland, FL to Atlanta, GA.
“At our scene shop run by Graydon Swedberg, we were able to completely assemble and dry fit all pieces and parts. Once this phase of the build was complete, Coordinating Director of NBA TV, Brent Berkman came to FL to have a look at the set to see the true scale and make any adjustments before final surface laminate was applied,” said Christopher Runnells, president and owner of ISD. 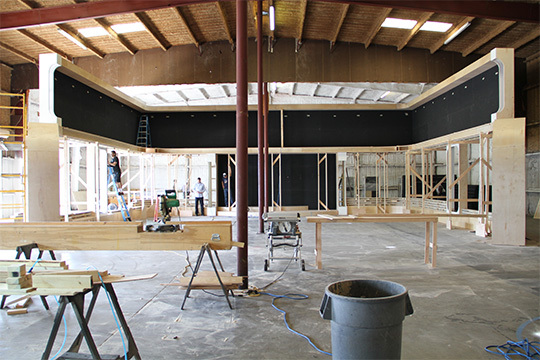 “After looking at renderings for months, to see the framing of the entire set in the warehouse was almost overwhelming. It looked big and I knew ISD had grasped our vision,” said Brent Berkman, coordinating director of NBA TV. The first part of the installation was the floor. Partnering with Horner Flooring, a longtime NBA partner, it took 10 days to install, stain, pain and finish. Then the floor took a week to cure and harden. In total, the installation took 17 days, with the final five reserved for integrating technology and video systems. 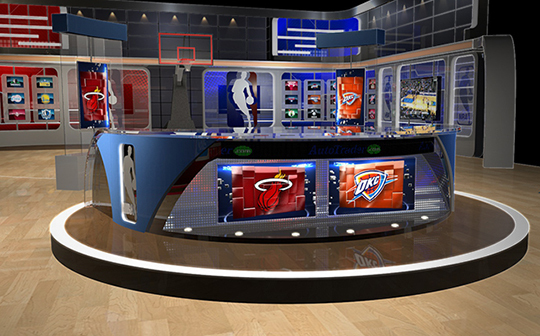 In just seven short weeks, Innovative Show Design was able to realize NBA TV’s vision of a new studio, capturing the motion and energy of the game. The design was able to bring in color, technology and a real NBA court. With over 5,120 hours spent on over 5,000 square feet of space, the NBA TV studio represents one of the top sports sets on television. Watch for the final part of the three part series later this year.